Apistogrammas (SA dwarf cichlids), Arrowanas, Rainbows, Sharks, Bettas, Clown Loaches, Discus, Exotic Plecos, Fancy Goldfish, Koi, Oscars, Synodontis (Afrian Catfish), African Cichlids, FW Barracudas, Exotic Lobsters, Clown Knife, Dwarf African Frogs, FW Stingrays, FW Red Crabs, plus over 200 types of community fish and many other rare/exotic fish! Amazon Swords, Anacharis, Apons, Java Fern, Java Moss, Tiger Lotus, Water Sprite, plus many more !! 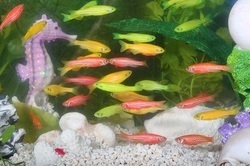 Seeing is believing with GloFish®—they are extraordinary! Both hardy and beautiful, GloFish are perfect for hobbyists and beginners alike. Available in three striking colors—Starfire Red®, Electric Green®, and Sunburst Orange®.